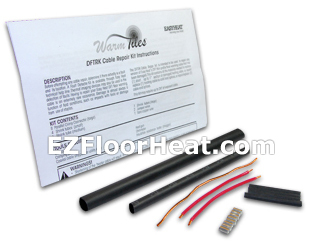 The DFTRK Cable Repair Kit is intended to be used to repair any version of the Warm Tiles® DFT thin profile floor warming cable. This kit contains all the materials needed to replace a short section of damaged heating cable (1" or less), or repair/replace the heating cable to cold lead splices, or repair/replace two cable end splices. Repair may require exposing up to 24" of an installed cable.